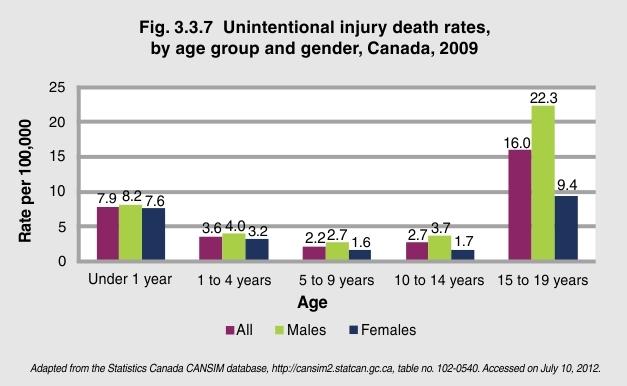 Unintentional injuries continue to be the leading cause of death for Canadian children and youth over age 1. The highest rate of unintentional injury death is in the 15 to 19 year age group, at 16/100,000. In 2009, 360 youth aged 15 to 19 years died as a result of an unintentional injury, for a rate of 16.0/100,000. The unintentional injury death for infants was 7.9/100,000. Starting at an early age, males experience more frequent and severe unintentional injuries than females1. The unintentional injury death rate of teenage males is almost 2½ times that of females.